I am a woman, a mother, a wife, a sister, a daughter, an Auntie, a friend, a Christian, a worker, a Healthcare Provider, a blonde, a Taurus, an American, a girly girl… and on and on and on…but is that who I truly am? The answer is…no. These words describe me as I appear on this Earthly plane, but in many ways distract me & others from my true essence… my Spiritual identity as a child of God. My Purpose and my Peace are independent from these Earthly descriptors… none of which hold true happiness and true Peace. Each of these roles and descriptive characteristics can indeed bring blessings into my life but can also trip me up if I confuse them with who I really am underneath. These descriptive categories can lead me into a false sense of self and away from who I truly am. I see myself as a woman and if I base my identity on that… what happens if I were to lose my breasts to cancer? If I define myself as a worker… where goes my happiness when I lose my job? If I define myself as a mother…where does my happiness flee when my children grow up & move away… or worse if I were to lose them through Earthly death? In life I will likely always feel the pain of loss… but God wishes me to never confuse what I do, where I live, what I look like, or any role with who I truly am. Looking for Peace & happiness in our Earthly identities will always leave us feeling the sting of pain, emptiness & loss. Living constantly in Fear of losing our identity we could live our life with subtle anxiety keeping us from Peace. Eternal happiness & everlasting Peace belongs only to things of the Spirit and of God. Looking anywhere else will always be futile & unfulfilling. What most of us need is an “identity adjustment” to correct the mistaken identity we have created for ourselves. The true identity of who I really am… is a Spirit, a Soul, a child of God, & a vessel for His Love. This identity cannot, nor will never be taken away… it is unchanging and everlasting. Building our worth and identities on this is like building a house on stone. This is so much better than the “sand built” identities we might create for ourselves in hopes this will bring us the worthiness and fulfillment we crave. 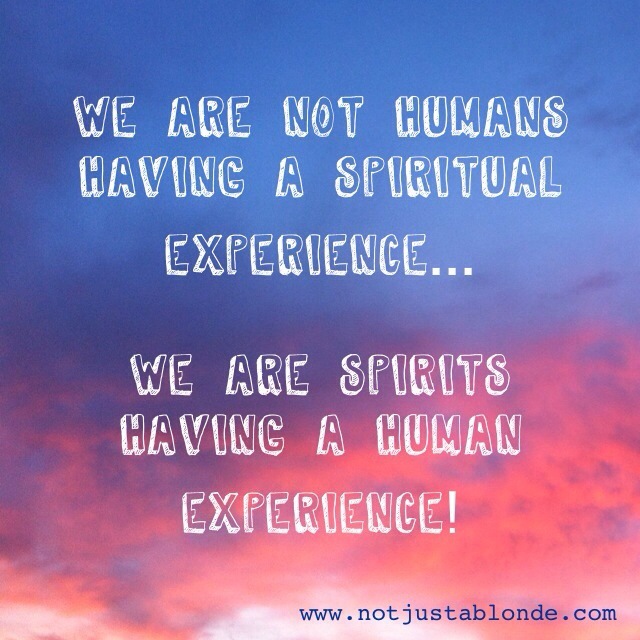 We can correct our mistaken identities simply by remembering… we are Spirits having a Human experience… not the other way around! Nice post. I love the quote at the end, which is from Pierre Teilhard de Chardin. See you there and back here. Great blog and thank you for the follow..
← For the Love of God… Forgive Yourself!